Last year saw new technologies and innovations taking the mainstream stage globally. Just remember what was on TV, social media or set the topic of your small talk at the office – the rise of technology served as the main headline and outcome of 2017. Its impact on society and the way we interact with each other is exceptional, and what’s more important – tangible. The Fourth Industrial Revolution is disrupting almost every industry in every country, and its propagation has no historical precedent. The entire areas of life are subject to change, and this transformation will be unlike anything we have witnessed before. “Technology has a critical role to play in addressing each of the major challenges the world faces, yet it also poses significant economic and social risks. It is vital that we develop shared norms and protocols to ensure that technology serves humanity and contributes to a prosperous and sustainable future,” said Jeremy Jurgens, Chief Information and Interaction Officer, Member of the Executive Committee of World Economic Forum. In banking sphere, these changes lie within fintech – the use of technology to deliver financial services and products to consumers. Fintech could be applied in various areas of banking, from insurance and investing to basically anything relating to finance. Despite being traditional in the good sense of the word – the foundation of banking has insignificantly changed over the centuries – bank institutions were among the first ones to explore new opportunities. In May 2017, China’s central bank has established a fintech committee to analyze the influence of technology on monetary policy, financial markets, stability, payment and clearing mechanisms. The PBoC (People’s Bank of China) statement says technologies have “injected new vitality“, but also “brought new challenges” for the banking sector. This statement is crucial as it contains the main question for this part: are these challenges worth the trouble? Many professionals in the industry, despite being restrained in comments, have little doubt about it. They believe that technological innovations in financial services could result in the creation of new business models and applications. According to data released by CB Insights, venture capital investment in financial technology companies grew 38% worldwide in Q2 of 2017 from the same period last year. The main question here is how will central banking evolve over the next several years to come. As Singapore central bank chief Ravi Menon commented on Bloomberg: “Financial technology is going to be the future of financial services. You just have to be discerning — not to be too wide-eyed about it, but at the same time, not to be cynical about all new technologies. We should experiment with an open mind.” The following chart illustrates some of the most relevant responsibilities of central banks that may be more exposed to changes brought by fintech. It’s logical to start with virtual currencies: over the whole year they were frequent newsmakers through words like “blockchain”, “bitcoin” or “etherium”. In case you still wonder what blockchain is, here’s the definition by Dan and Alex Tapscott from their book “Blockchain revolution” (2016): “The blockchain is an incorruptible digital ledger of economic transactions that can be programmed to record not just financial transactions but virtually everything of value.” Another great feature is that no single entity can control the blockchain, which results in the possibility of validating peer-to-peer transactions….. without central banks. 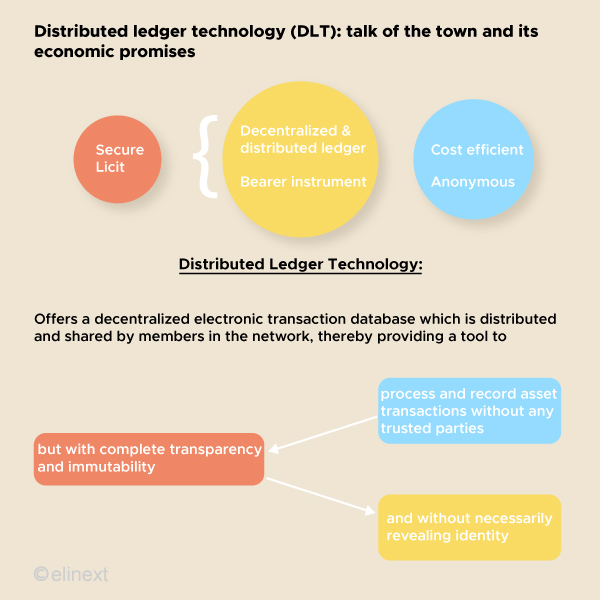 All thanks to a distributed ledger – a tool for recording financial transactions that are shared across the network of many computers, rather than stored in a central location. However, even if it may sound a bit menacing for the central banking sector, the blockchain and virtual currencies pose little or no challenge to the existing order. For now, bitcoin or other cryptocurrencies are too unpredictable and risky. Secondly, the technology behind it – the blockchain – isn’t yet fully scalable. But the emphasis goes on “yet” – all these issues could be addressed in a proper manner in future. As Christine Lagarde, managing director of the International Monetary Fund, commented “the best response by central bankers is to continue running effective monetary policy while being open to fresh ideas and new demands, as economies evolve”. Although it may sound unbelievable, in the long term, virtual currencies could replace fiat currencies worldwide. There are several reasons why it may be possible. “One day it will be easier and safer than obtaining paper bills, especially in remote regions,” said Lagarde. “And because virtual currencies could actually become more stable. Potentially, virtual currencies offer a variety of benefits: no settlement risks, no clearing delays, no central registration, no intermediary to check accounts and identities. Even if they remain risky and unstable, citizens may address central banks to provide digital forms of legal tender. And that’s where central banking may gain ground. Another option is the creation of Central Bank Digital Currencies (aka CBDC). In spite of the fact that cryptocurrencies are often criticized by a number of economists and banking executives, they can be turned into an ambitious project by the blockchain technology. “Digital currencies issued by central banks will make transactions more efficient while cryptocurrencies serve as a vehicle for illicit activity”, economist Barry Eichengreen told CNBC in October 2017.
separate the current joint roles of credit and money creation by commercial banks, creating a more narrow banking system, in which banks and financial institutions work with a 100% equity and no leverage. In fact, recently a consortium of four large banks (UBS, Deutsche Bank, Santander and BNY Mellon) has announced the development of what they call a Utility Settlement Coin. To make a long story short, this proposal puts an extra layer between the commercial banks and the central bank separating the means of settlement from the fiat currency backing the settlement. The idea went viral in the banking world as four new members including such reputable names as Barclays, Credit Suisse, Canadian Imperial Bank of Commerce have joined the project. And what about AI? According to the IBM report on “10 Key Marketing Trends for 2017”, 90% of the data available today was generated in the past two years. This means that the volume of data will only be increasing with time. And this puts an emphasis on security as these two notions are inseparable. Gaining clients’ trust is the key notion here, and it seems like fintech may be a great solution. Let’s take, for instance, Google: we are used to giving them access to the private data on our phones and laptops, and we trust them without a second thought. Fintech works in the same way. Services like Wirecard, Nutmeg, Juergen Schmidhuber’s lab’s work on AI that can outthink a human banker or trader by a thousand-fold, represent the examples of how fintech might work. However, let’s not be too bold (say, overreacting) in our expectations. Strong suspicions are that we won’t see robots sitting on monetary policy committees in the near future, but the advances in deep learning are opening up areas of artificial intelligence that previously seemed highly speculative. Most applications will likely stay out of the limelight, but, for example, the idea of using of AI in banking analysis doesn’t seem to be borrowed from a sci-fi flick. As Jana Marečková, a Ph.D. candidate at the University of Konstanz, comments on deep learning systems, “there is a long way to go, but they are going to be really powerful once they start doing what they promise”. Sure, the fintech technology is relatively new, and its adoption remains the biggest challenge for central banks. However, once thought to be only applicable to the private sector, fintech is now considered as a new direction to help central banks in a number of ways. Fintech brings along a serious reconsideration of the way that payment and settlement systems operate. 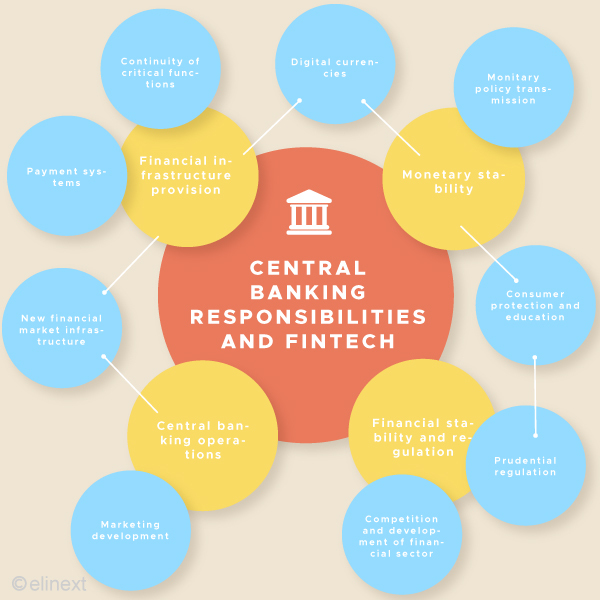 A central bank’s interest in fintech is not limited to its implications for the financial sector, but rather to its potential pros and cons for financial stability and the conduct of monetary policy. Here at Elinext, we work with our clients to select the solution for your specific needs. Contact us at [email protected] and let’s bring the benefits of technology to your organization.